Format: 6-weeks course with one 2.5hrs (or 2hrs) session per week. Some homework is recommended between the weekly sessions. Small class size (3 students) allows focused, hands-on instruction with individual support for each lacemaker, so everybody can learn at their pace. Despite the classes being intensive and thorough, the atmosphere in the studio is relaxed, and we do have a lot of creative fun together. The weekly classes are held in my studio and scheduling is therefore flexible. Dates and times are listed below, but I can accommodate other days as well, as long as there are 3 people who agree on the same schedule. Please do let me know your availability and I will see if I can co-ordinate with others to open a new class. All instruction printed materials are included in the tuition. Materials for beginners are included in the tool kit. Other specialty materials (lacemaking thread, lacemaking wire, bobbins, pins, etc.) are available for purchase in the studio. 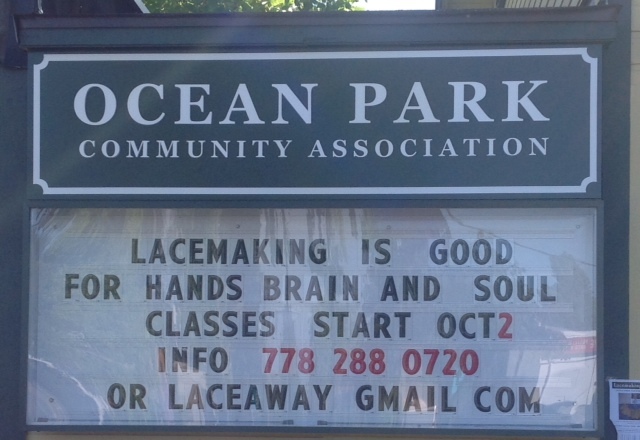 Additional classes open on demand – please contact me by e-mail: laceaway at gmail dot com or by phone 778.288.0720 if other day and time would suit you better.